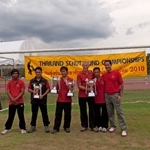 Thai National Schutzhund/IPO Championships. Consists of IPO/Schutzhund part B and part C. Siam Crown's dogs placed 1st, 2nd, 3rd and 4th in IPO 3 with Criket van het Berkenmeer as national champion, Cartouche van Beukenhage 2nd place, Bondy Tufra 3rd place and Nitro van de Vastenow in 4th place. The competition is unusual in that there is a separate part C only IPO 3 entry that does not compete the dogs in part B and C. Siam Crown placed 1st. with our 11 1/2 year old Heksie Beppie van de Vroomshoeve. In IPO 1 Beta of Siam Crown placed first. The gang had a great time. 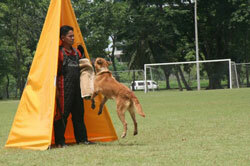 Our congratulations to Poompitak who was the protection part C only winner in IPO 3 with his dog Arco. Michael Lee from Tigerland K9 Malaysia did a great job judging. Uthen Nathanrom and Henry Yew did the helper work with gusto.